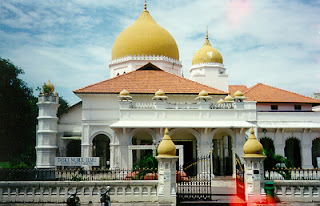 The Acheen Street Mosque also known as Masjid Melayu(Malay Mosque) is situated on the southern end of Georgetown, Penang on a street known as Lebuh Aceh. This mosque, which is believed to have been founded in the early 1800’s, is one of the oldest mosques in Penang. Historical records indicate that the land on which the mosque stands today, was donated by a wealthy Arab trader Tengku Syed Hussain Al-Aidid, who lived in the vicinity. In fact, the area around Lebuh Acheh, was the original Muslim quarter of Pulau Pinang, home to shops, houses and madrasas (religious schools). 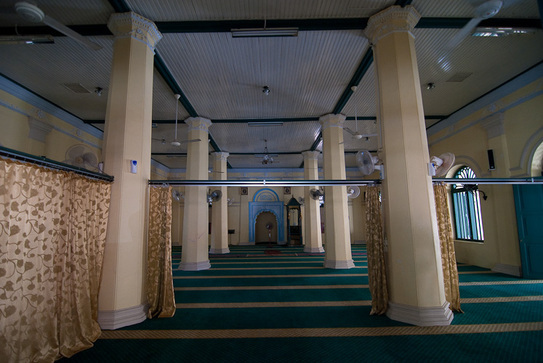 The founding of this mosque further increased the appeal of the area, such that aside from being frequented by the local populace; Arab and Indian Muslim traders from around the region also began to stop by the area when they arrived on trade trips to Penang. Tengku Hussain passed on in the mid 1800’s, but he had preformed an invaluable service for the area of Lebuh Aceh by founding this mosque. The area around Lebuh Aceh continued to thrive and soon came to be known as Second Jeddah. This was mainly due to the fact that pilgrims and their families used the mosque as a starting point before heading on to Mecca by sea. This practice continued right until the 1970’s, until the Lembaga Tabung Haji (the Haj board) was established in Kuala Lumpur to facilitate pilgrim’s journeys for Haj. Today, the mosque is a noteworthy attraction in Georgetown as it is renowned for its rather unusual appearance. Most local mosques in Malaysia are equipped with Moorish-style minarets but not the Acheen Street Mosque. This ancient mosque is outfitted with an Egyptian-style minaret that actually bears a hole halfway to the top. This indentation dates back to the Chinese triad riots of 1867 in Penang, a bloody period, which featured much fighting and bloodshed. The rest of the structure of the Acheen Street Mosque displays a delightful mélange of Moorish and Chinese design elements, easily visible in features like the mosque’s entrance archway, the small domes on its parapet, its columns and others. The Acheen Street mosque and its environs are definitely worth a visit for they provide a valuable insight into the history of Penang’s ancient Arab trading communities and if you have any interest in the subject, you may want to include a visit the Acheen Street Mosque in your itinerary.